My name is Bill Thomas, and as a consultant, author and publisher I've seen from first-hand experience how limiting and frustrating of an experience people have when they go online looking for information about emerging trends, a business strategy, answers to questions, and even multimedia. You can change that today - right now! Put your time online into content-consumption overdrive - less time searching, more time finding & applying the ideas you discover? Search is now the #2 most popular activity people do online. For some people, it's #1. Why? Because we're born to be information junkies. Our brains love to consume content - enjoy it, learn from it, and share it, and these days, the Web feeds that need like nothing else. The Web is overflowing with all sorts of great, quality content about any subject you can imagine. There are tutorials, ebooks, tips, audio clips, video clips, articles, news stories, discussion groups and more about everything from digital photography to Vietnamese cuisine - whatever you want - if you know where to find it and how to get your hands on it. When it comes to discovering quality content online, most people only scratch the surface of utilizing the power of the search tools that are available to them online. InfoFinderPro - Your Personal 'Answer/Content-Machine'! 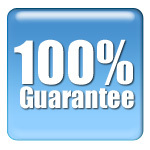 Increases the quality of content you find online - guaranteed! Web Search Tools - Many of the most powerful and popular Web search tools are available to you within a single click! Google provides relevant results, Ask provides a number of useful tools, Pagebull displays large thumbnailed images of relevant pages. Can't decide which one to use - use them all, and more (including Live, Clusty, Yahoo, Exalead, and more)!!! Discovery Search Tools - Discover facts, FAQs, secrets, links, resources, and guides related to your keyword. There are many extensive resources that provide this kind of content and information, for nearly any topic you can imagine. 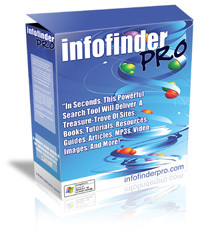 InfoFinderPro will easily help you find them. Learning Search Tools - Is there something you would love to do, or love to do better - draw, golf, scrapbooking? Get tips, tutorials, how To's, help and ideas about topics that interest you. It's all just a click away! Image Search Tools - Find images, animations, wallpapers, artwork, and drawings related to your keyword. Want only black & white images? No problem! Experience the world via the billions of images now online - all at your fingertips. Audio Search Tools - What are you wanting: audio clips of a speech, a song you just heard, MIDI music you can sing to, CDs, sound effects, podcasts, or lyrics to help you sing along to your favourite song? It's just a click away. Video Search Tools - New to the Web (thanks to faster Internet connections) is video. With some of the new video search technologies that are beginning to hit the Web, you have access to news videos, instructional videos, historical videos, and even peoples' personal videos (that they've posted online). When researching a subject, how useful would full-motion video be? InfoFinderPro is the best search tool to bring it to you, including YouTube, Google Video, Yahoo Video, DailyMotion, and many others. Reference Search Tools - Find articles, answers to questions, encyclopaedia entries and FAQs related to your keyword(s). Discover how it works, its history, and tap into the Internet Archive (a huge online archive) for finding recordings, commercials, software, and texts related to it. News Search Tools - If you're familiar with Internet research, you know that the news usually contains some of the freshest content available online. InfoFinderPro enable you to easily discover news articles related to your keyword(s) from some of the best news sources online including, MSNBC, Google News, Yahoo News, and Topix. RSS/Blog Search Tools - If you haven't yet heard of RSS feeds and blogs, you will - very soon! They represent some of the most powerful information sources to hit Web in several years. InfoFinderPro has extensive support for helping you locate RSS feeds and blogs related to your keywords. File/document Search Tools - The Web is about more than Web pages. There are millions of documents available online too! Relevant PDF documents (ebooks), Word documents, PowerPoint presentations and Excel spreadsheets. InfoFinderPro will bring them to you. Word Search Tools - What would you like to discover about a word: its definition, a synonym, antonym, quotations it appears in, words with the same meaning, words containing the same letters? It's better than having an English professor as your assistant. Multi Language Search - Take your search around the world and discover content in the four corners of the Earth. With a click you can send your query to country-specific/language-specific search engines found in the United Kingdom, Canada, Australia, German, France, Italy, and Spain. Public Domain Content Search Tools - Find great free content published by the U.S. government, public domain (free) content, and even 'secret' content that Google will give you that most people will never find on their own. Health Search Tools - Everything from information about treating allergies and tips for getting great sleep, to the latest health news about a health topic, health videos, nutrition information and recipes. Travel Search Tools - So, you're planning a trip to Rome? Or is it Hawaii? Or Sydney, perhaps? It doesn't matter! Enter the name of a location into InfoFinderPro and you'll be a click away from travel tips, sights to see, maps, webcams, pictures, videos, and even the local weather. 'Life' Search Tools - Find tons of great information related to your house and home. Find answers to do-it-yourself projects (such as gardening, roofing, remodelling), discover just the perfect recipe related to an ingredient (onion, chocolate, BBQ, and others), learn about that new car you've had your eye on (Mazda 6, Nissan Maxima, Pontiac G6), and find pet-related advice, tips, articles and resources. Related Searches - The related searches functionality is one of the most useful tools found in InfoFinderPro. (For example, when searching for the term 'weddings', InfoFinderPro's related searches feature will reveal to you all sorts of related terms you might find helpful, but may have not thought of on your own, such as: favors, invitations, photographers, ceremony, honeymoon, reception, registry, dresses, gowns, vows, showers, flowers, and jewellery, just to name a few). Enter A URL - Get Relevant Tools - A URL is not just a URL. Use InfoFinderPro to quickly retrieve the current URL's Alexa ranking and other useful information that Alexa provides. Find other pages on the Web with related content to a particular URL/site, find recent blog posts related to what's discussed on a particular URL, discover archived versions of a site. Grab images, audio, video, PDF's and Flash movies found at a particular URL with ease - turns every site on the Web into your personal information/media candy store! Enter A Zip Code (US) - Get Relevant Tools - Enter a US zip code into InfoFinderPro's main search box, and instantly get links to maps, weather, movie show times, local news, census data, and more! Works great while at home or on the road. Enter A Question - Get Relevant Tools - When you enter a question into InfoFinderPro's main search box, it detects that your query is a question, and it instantly displays links to a number of services/sites that are specifically designed for answering questions - not search engines, but answer engines. Universal Bookmarking/Sharing Integrated - These days, as people surf around and find content that interests them, they either use one of the fantastic online bookmark managers available, or they share their discoveries with others via sites like digg.com or reddit.com. By integrating technology from AddThis.com, InfoFinderPro gives you one-click access to bookmarking or sharing the pages/content you discover virtually any way you choose. That's not a typo - the price for this incredibly useful software is just $39.95 $19.95. (There currently is not a Mac version - sorry!). Discover How To Catch The BIG Sales Letter Evolution! How is such a low price possible? Well, instead of charging some outrageous price, thus limiting who can experience and benefit from it, I'd rather get it into as hands of as many people as possible - yours included. If at any point within the next 30 days you decide InfoFinderPro is not suitable for you then simply contact me and I will issue you with a prompt and courteous refund. Don't Miss Out On This Steal Of An Offer!